Visiting Daniel Djojoatmo at his house in Commewijne, east of Paramaribo, I was at first drawn to his watercolurs of decaying cars, the detritus of modernity, trade routes, and “foreign used” vehicles, dumped all over the Caribbean from Japan, now being absorbed by the jungle. The images of these vehicles rusting and being enveloped by vines discuss the predicament of certain narratives of development which are, at their inception, ill-fated and at the disposal of the jungle. 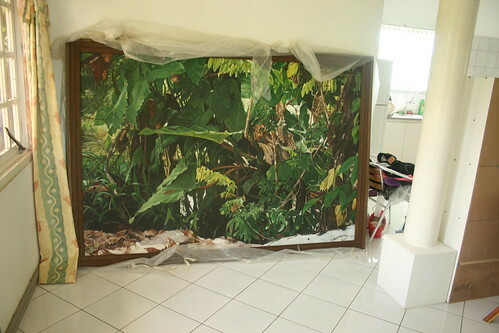 Then in Danny’s studio I saw a large, obsessively constructed photo-realist painting called Republiek. It was a very grand and meticulous rendering of an obscure little section of tropical forest floor, looking almost like a botanical sample. The connection between the grand-sounding title and scale and the obscure perhaps personal moment said something about the shifted and shifting subject. Republiek, I discovered, is a popular weekend and holiday location south of Paramaribo, a place for a family outing or for dating couples. But in this painting the sight, or accepted or familiar view or scene, is not obviously illustrated in the way we are accustomed to from the era of topographical nationalist and or touristic rendering. We are left to wonder what kind of sly commentary is at hand, or adjusted sense of value of the location. Because of the over-commodification and overloaded symbolic register of the local landscape, Danny is involved in rethinking from a personal level his interests and relationship to place. By zooming into fragments of the landscape, he makes them unfamiliar, and interrogates the idea of public space.